Fillings & Root Canals - Dentallive Clinic LTD.
To restore your tooth to proper function and eastethic when you have a cavity or broken tooth. Silver fillings (amalgam) is a safe alternative to white fillings. They are usually used in the posterior of the mouth due to aesthetic concerns but provide a strong filling material. Patients have concerns about the "mercury content in the silver filling". 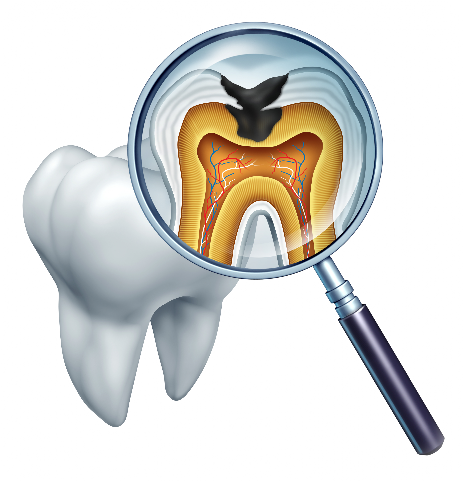 Don't worry, there is no evidence that amalgam fillings have a detrimental effect on health of a patient. White fillings (composite resin) are the most commonly used filling due to their look, function and longevity. Always remember no filling is forever, marginal breakdown over years is the most common reason for replacement of white fillings. The techniques used by our dentists at Dentallive Clinic allow for tooth structure being replaced without the tooth looking like it has a filling. Dental Sealants are highly effective in preventing decay on the biting surfaces of your chewing teeth. Sealants are a quick and easy tooth-colored acrylic "coating" that is painted onto the surface of the tooth. This effectively "seals" the deep grooves, acting as a barrier and protecting enamel from plaque and acids. Easy to apply, sealants take only a few minutes to seal each tooth. Sealants hold up well under the force of normal chewing and can last several years before a reapplication is needed. Children and adults can benefit from sealants in the fight against tooth decay. WHAT TO EXPECT FROM FILLINGS? With all fillings a rubber dam Is required because the filling requires a dry operating field. Since you are frozen the bite may not be perfect because let's be honest you can't really tell if something doesn't feel right until the freezing comes out. Sometimes this leads to "sensitivity when I bite down on one spot" after a filling. Let us know if you are coming in for a regular checkup and cleaning or give us a call to make the filling feel 100%.